Such is the popularity of this exquisite Indian fragrance that even Czars like Bob Dylan and The Grateful Dead burnt them at his concerts. Even The Fleetwood Mac refers to it in their song "Illume 9/11" , from the album Say You Will. During the 60's numerous hippies acquired a taste for this ubiquitous fragrance and since then, it is closely related with the hippie counterculture community. Found commonly in Indian incense, soap, perfume oil, candles and personal toiletries, Nag Champa comes from the Indian flower Champa, known as Plumeria in the West. The typical grey color and the damp texture of these incense can be solely attributed to the hygroscopic, semi-liquid resin "halmaddi" (from the Ailanthus Malabarica tree), which is used to process it. 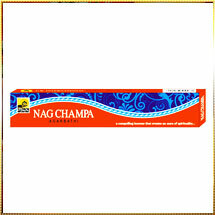 Maya Nag Champa incense offered by us possess a dark grayish color and strong earthy scent, which is evident even before the incense is burned. Moreover, they are befittingly packed so as to ensure that they retain their natural essence and aroma till they reach our clients.